Here’s another dish featuring the spoils of my good friends’ garden. During our visit, my boys learned how to get into the dirt and dig for potatoes, an activity I highly recommend for 8-year old boys, or girls for that matter! After they did the dirty work, I was only too happy to put the buried treasure they found to good use. This elegant salad plates so beautifully. But don’t be fooled by how dainty it looks because it’s just as satisfying. I decided to serve my nicoise with seared scallops, as opposed to the traditional tuna. Really, though, you can serve it with just about any protein you like. Or leave out the protein altogether. 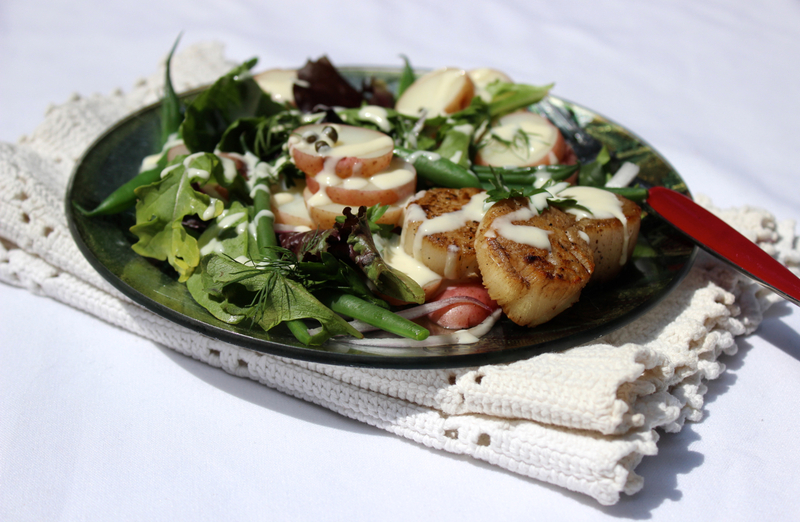 If you do, however, choose to go with scallops, let me give you a couple of tips for cooking scallops successfully. They can be tricky to get just right at home and I’m not too proud to admit that I’ve had my share of failures with them. But once you get them right, they can be really divine and they provide a fine accompaniment to this late summer salad. To make the dressing: In a small bowl combine all the ingredients with 1 tablespoon of water. Mix well to combine. To make the salad: Bring a large pot of salted water to the boil over medium-high heat. Meanwhile, prepare an ice bath by filling a medium bowl with ice cubes and water. This will be used to quickly cool down the haricot vert when you pull them from the boiling water in which they are cooked. Add the haricot vert to the water and cook for about 3 minutes, until crisp-tender. Using a slotted spoon, remove the beans from the water and place them directly in the ice bath. Add the potatoes to the pot and cook for about 8 minutes, until tender but still holding their shape. Using a slotted spoon, remove from the water. Discard boiling water. While the potatoes are cooling to room temperature, in a large bowl, combine the onion, lettuce leaves, capers, parsley, dill, and cooled and dried haricot vert. Toss to combine. Divide between four plates. Add the potatoes to the salad plates and drizzle the plates with all but 1 tablespoon of the dressing. Add the seared scallops and drizzle the remaining dressing over the scallops. This entry was posted in appetizer, lunch, main, salad, side and tagged creamy dressing, green bean, haricot vert, nicoise, potato, salad, scallop. Bookmark the permalink.